The PEGAS Project Manager visited the Democratic Republic of the Congo (DRC) on October 12-24, accompanied for the first three days by Jef Dupain, Director of the AWF African Apes Initiative. Jef introduced the Project Manager to the president of Juristrale, a local Congolese NGO that is collaborating with PEGAS in the area of great ape trafficking investigations. 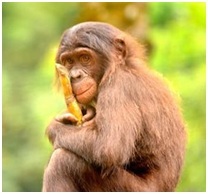 Aided by a Juristrale assistant, valuable information was gathered about the source areas of great apes that are trafficked in Kinshasa (the capital of DRC), the trade routes and transport methods (see maps at the bottom of this post), the people involved and sample prices of the different species. 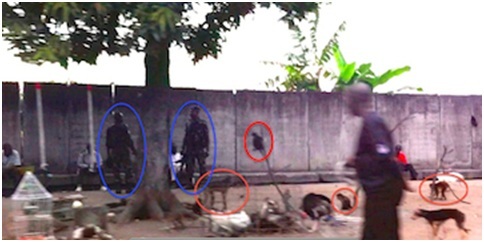 Trafficking location on a main road, where middlemen dealers are protected by soldiers (circled in blue). Monkeys for sale are circled in red. Accompanied by Jef Dupain, PEGAS also met with Cosma Wilungula, the Director General of the Institut Congolais pour la Conservation de la Nature (Congolese Institute for Nature Conservation), which manages DRC’s protected areas and serves as the CITES Scientific Authority. The Project Manager briefed the DG on the objectives of the PEGAS project and received assurances of full cooperation from ICCN. The DG stated that he was committed to ending the trafficking of great apes and the illicit use of fraudulent CITES export permits. A visit was also made to Lola ya Bonobo where Fanny Minesi, daughter of Lola founder Claudine André, gave the Project Manager a guided tour of the bonobo sanctuary. Lola stands ready to provide long-term care for any bonobos that can be rescued from captive slavery. 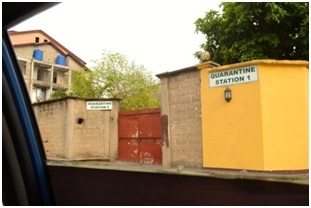 The mission to DRC has resulted in a number of follow-up actions that will be announced in future posts. 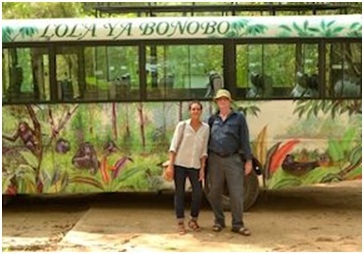 Lola ya Bonobo’s Fanny Minesi, pictured with Dr. Dan Stiles of PEGAS. This entry was posted in CITES, DRC Congo, ICCN, PEGAS, sanctuaries and tagged CITES, DRC Congo, ICCN, PEGAS, sanctuaries. Bookmark the permalink.